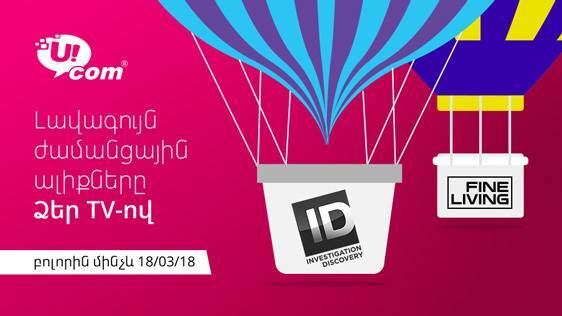 Till March 18 «Fine Living» (144th channel) and «Investigation Discovery» (51st channel) TV channels will be available for all Ucom subscribers. In case these channels are not included in a regular TV package or are not taken additionally, then after March 18, upon subscriber’s wish, those can be added by paying the monthly fee of 220 AMD for «Fine Living» and 220 AMD for «Investigation Discovery». To add these channels to the main list there is no need to visit the service center, one should simply call the Customer Care at 011444444 phone number. Let us remind that «Fine Living» TV-channel is designed for women. Themes and issues related to lyfestyle are discussed and presented in the context of fashion, travel, cooking and childcare. The reassessment and appreciation of the woman’s role is the main goal of the TV-channel. And the «Investigation Discovery» Tv-channel, the main audience of which are also women, includes a number of entertainment programs, criminal programs, documentaries based on the judicial investigations. The presented programs will not leave indifferent any TV-viewer due to their unexpected developments.